The delicious taste of the famous Thai coconut soup finally on a bun! Many of you probably know the tasty Tom Kha Gai soup with its rich and delicious Thai flavors. Creamy coconut, succulent chicken and those incredible Thai aromatics make it unbelievable and irresistible. When I went to Budapest in Hungary last year, I went to an amazing hot dog shop called TöLTő (check out the whole travel post here). 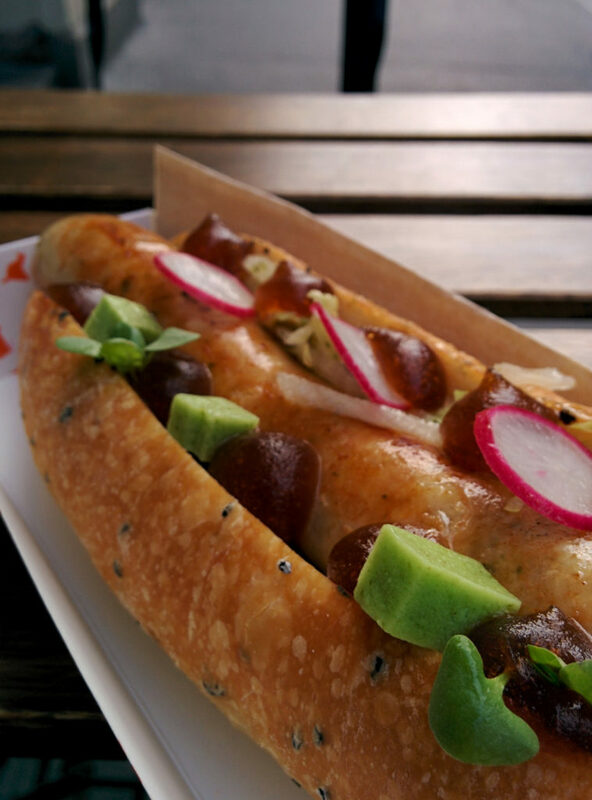 Their lime ginger chicken hot dog blew my mind. It had that exact flavor of Tom Kha Gai, but then in a solid form. I wanted to recreate that flavor myself. However, as I’m not an artisan sausage maker , I had to think a bit outside the box for this. In my head the easiest way to do this was to make a pulled chicken sandwich. By poaching the chicken in coconut milk with the typical Thai flavors, I would be able to recreate that taste without having the hustle to make sausages. To make this dish taste like the real deal you will need to head over to your local Asian supermarket. Grab some kaffir lime leaves, which can usually be found frozen, as well as some fresh galangal root (also known as galgant or ‘laos root’). In case you can’t find kaffir lime leaves you can use the zest of half a lime. If you can’t find fresh galangal, use dried galangal or powder. Also unable to find that? Use ginger as the two roots are somewhat related, but be ready for a somewhat different taste, which is still delicious. Usually Tom Kha Gai does not feature peanuts. However, in order to make a nice firm sauce the peanuts work just perfectly to create a thick dressing. The flavor of the peanuts is quite subtle but the richness makes this dish even better! Give it a try! If you like your dish spicier, chop up the Thai bird chili peppers and leave them in the dish. By only piercing them with a knife and removing them afterwards you will get the floral flavor of the chili, without being overwhelmed by the heat. 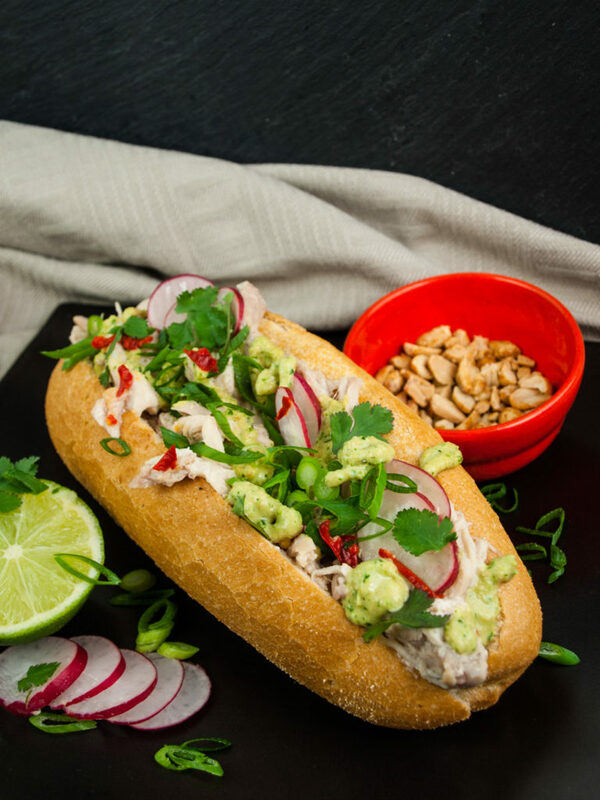 Go ahead and create a delicious sandwich that has the authentic flavor of Tom Kha Gai in a solid form! Put a medium sized heavy pot over medium-high heat. Pour in the coconut milk, add 2 tablespoons fish sauce (reserve half a tablespoon for later), brown sugar, powdered bouillon, kaffir lime leaves, galangal and chili pepper. Give a good stir until everything is well combined. Add chicken and bring to a light boil. Once it starts bubbling, reduce heat, cover the pot and let simmer for 2 hours. Check on your chicken every half hour. If the sauce gets to thick or catches on the bottom of the pan, add half a glass of water and give it a good stir. Pour the coconut milk into the slow cooker, add 2 tablespoons fish sauce, brown sugar, powdered bouillon, kaffir lime leaves, galangal and chili pepper. Add the chicken and give a good stir until everything is well combined. Put the slow cooker on low and simmer for 6 hours. Once the chicken is cooked, fetch the chicken pieces out of the sauce and place them on a plate. Shred the chicken with two forks into strips. Fetch the galangal, kaffir lime leaves and chili peppers out of the sauce. Discard them. Pour 60ml of the coconut cooking liquid into a small mixing cup. Roughly chop the cilantro and add it to the liquid. Insert the peanuts, the remaining half tablespoon of fish sauce and the juice of half a lime. Use an immersion blender and mix until you have a thick homogenous sauce. Put the shredded chicken back into the cooking liquid to keep the pieces warm and moist. Thinly slice the radishes and spring onions. Slice the bread rolls halfway through. Spoon a big portion of the shredded chicken into the bread rolls. Spread some of the cilantro peanut sauce on top. Garnish the sandwiches with the radishes, spring onion and some more cilantro. Dig in! What do you think of this fusion food creation? Does it properly resemble the taste you are familiar with when you think of Tom Kha Gai? Do you think the peanuts fit just as well with as I do? Let us know in the comments below and let’s make this recipe even better!